Mobile devices have become ubiquitous in business, permeating every aspect of user productivity and customer experience, yet many of these are also personal devices left unprotected against advanced malware and OS vulnerabilities. Considering the vast amounts of sensitive data that are stored on and communicated through these devices, how do we maintain the essential controls, security and privacy that are essential in the cloud generation? - Learn about the various and advanced methods hackers use to attack and compromise mobile devices. 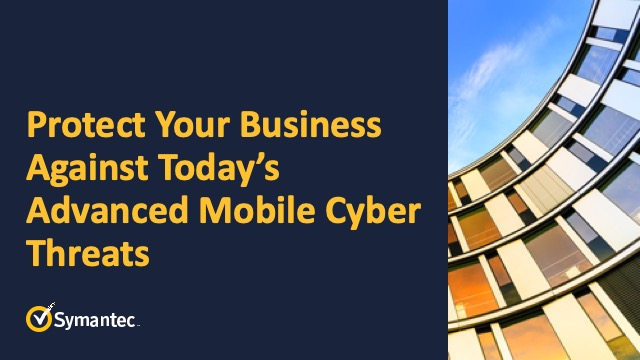 - Understand the importance of being able to Predict, Detect, and Protect against all types of mobile threats. - Learn specific strategies and technologies that will support the need for visibility and full protection of your mobile infrastructure.